At last, the high quality 70 mm space related IMAX movies are now available on DVD. 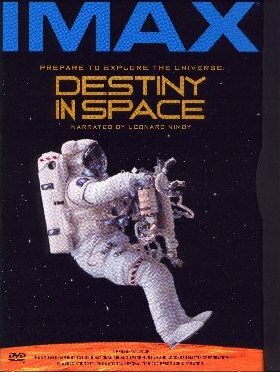 Destiny In Space, available on its own or as part of a 5-pack of space related DVDs, looks at our continuing exploration of our solar system and beyond. This 40 minute treat, digitally remastered from the original print and with a Dolby Digital 5.1 soundtrack, is narrated by Leonard Nimoy. From the beginning shots of a close up view of a night time shuttle launch, through fast animated runs over the landscapes of Venus and Mars and finishing with images of stellar nurseries in deep space, this DVD brings spectacular sequences into your home. Two in particular make you want to pick up the remote to replay them immediately. One featured footage from the repair mission to the Hubble telescope, and the other (my personal favourite), awe inspiring scenes of the Orbiter Discovery taken from an IMAX camera attached to the Orpheus satellite telescope. This presentation of the Smithsonian Institution's National Air and Space Museum and Lockheed Martin in association with NASA is filmed in part by the Astronauts themselves. Information about their involvement and some of the technical details of making this movie are included in one of three special features also available on the DVD (the others being the trailer for Destiny In Space and a general IMAX movie trailer). All in all a well put together DVD and one which anyone interested in spaceflight should have in their collection.